We've reported previously on several new NAD Hybrid Digital amplifiers such as the C338, C368, and C388 which have built-in DACs and network streaming or which can provide very sophisticated streaming services with the addition of a plug-in Bluesound card. 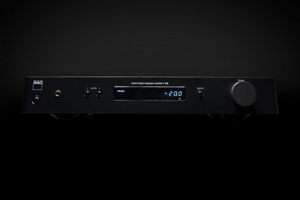 However, for those who want a lower cost solution with the advanced performance of a Hybrid Digital integrated amplifier that has a built-in DAC and Bluetooth capability but who don't need network streaming, NAD has now introduced the C328 Hybrid Digital DAC integrated amplifier at $549. The C 328 can wirelessly connect to any smartphone, tablet, or Bluetooth-enabled device within range for a very convenient listening experience. The C328 also has three analog inputs, including a moving magnet phono stage that lets you connect your turntable without the need for a separate, outboard phono preamp. There are also two coaxial and two optical digital inputs for your digital sources and a subwoofer output. It also features a headphone amplifier, letting you connect your favorite headphones for those times when you prefer private listening. Power output is 40 watts/channel. Just because the C328 is more affordably priced, that doesn't mean NAD has skimped on quality. Low-noise circuits, precise volume control action, and accurate channel balance are all key characteristics of the C 328. With the added bonus of proper input and output impedance traits, plus high overload margins and stability with difficult speaker loads, the C 328 is the best choice for music lovers who are just starting to build their first audiophile system.